Fully supports wireless connectivity with two open PCMCIA slots. 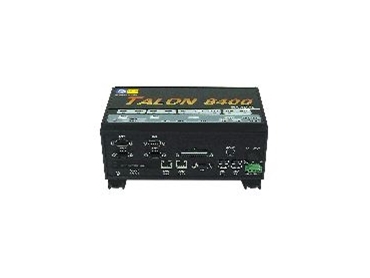 GE Fanuc Embedded Systems Inc. has released the Talon 8400, a small self contained PC using the Intel Celeron M Processor to deliver a system that requires low power, but still performs in harsh conditions. It has an operating temperature of 5°C to 40°C, optionally extended to -20°C to 50°C. The Talon has three PC/104-Plus expansion sites, making this a very flexible system for use in both new and existing applications. With a robust aluminium housing, the Talon 8400 is easy to install anywhere with the flexibility of being DIN rail, panel, or table top mounted. A UL 1604 option is available for hazardous locations, in addition to standard features including fanless operation and an electronic shutdown with an over-temperature LED for system overheating. This PC features 256MB of PC100/PC133 SDRAM, a 20GB hard drive and is outfitted with many I/O options, including two fast Ethernet ports, four USB 2.0 ports, an SVGA connector, one IEEE 1284 port and four individually isolated RS232/485 serial ports. In addition, the Talon fully supports wireless connectivity by way of two open PCMCIA slots. Operating system support for Windows XP Professional is available with the Talon 8400, which has UL, CE, NEBS level 3 and FCC B certifications. The Talon 8400 is available now.